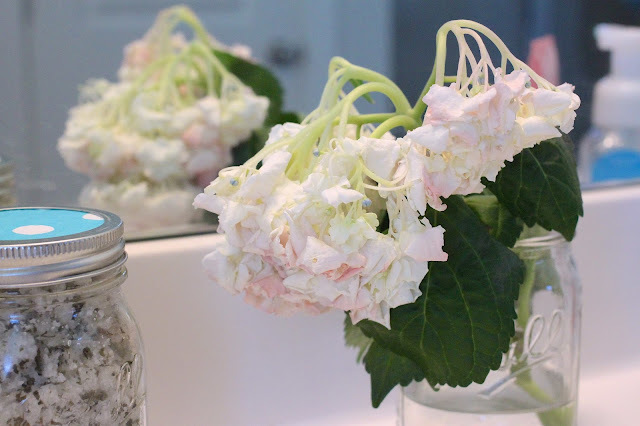 Last week, I bought a beautiful hydrangea bloom to use for my sweet tea sugar hand scrub post. 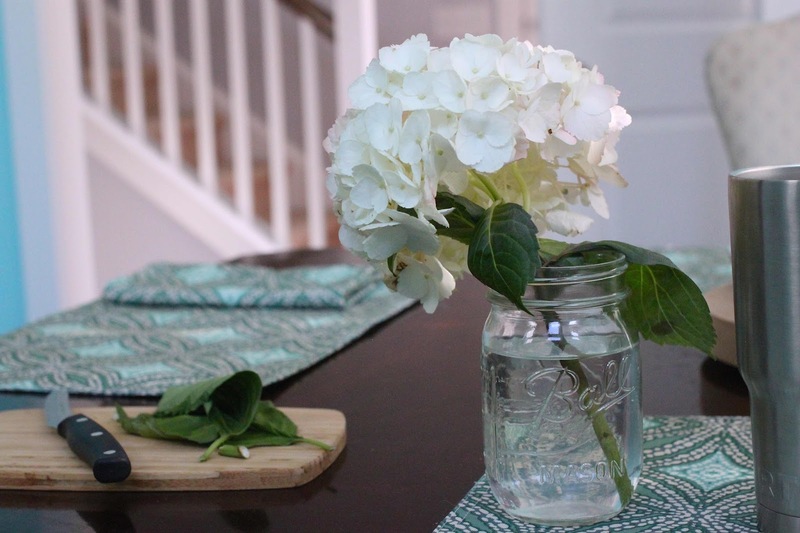 Blogging is the best excuse to always have fresh flowers in the house. They make great backdrops and accents to add little extra to my photos. Well, while I was in Florida this weekend, the flower sat in the same water for 5 days, slowly wilting. When I got back, Mike was ready to throw it away, but since the individual flowers were clearly still alive, I knew I could bring it back. While it takes a few hours, the method below definitely works and doesn't require anything but a knife and boiling water. First, take the cut hydrangea out of its water and cut off the bottom inch of the stem. Make sure the cut is done at a 45 degree angle. 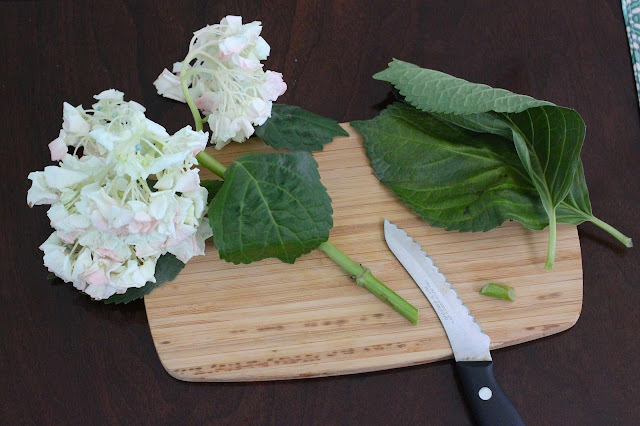 Slice up the middle of the hydrangea stem, as well, one to two inches, and finally, remove the bottom leaves from the stem. Bring water to a boil and pour it into a heat-resistant mug. 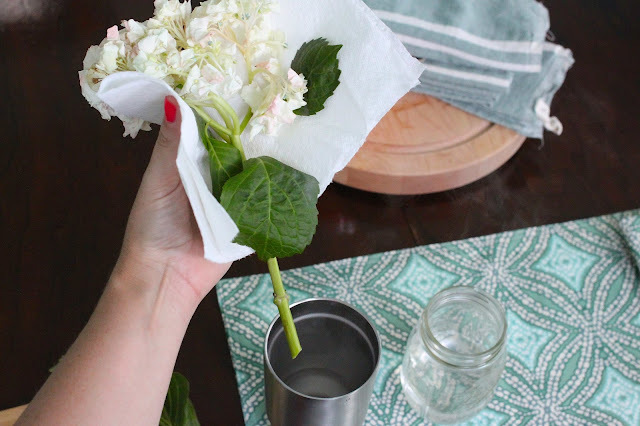 Wrap a paper towel around the remaining leaves and flowers to protect them from the heat. Place the stem in the boiling water for 3-4 hours. 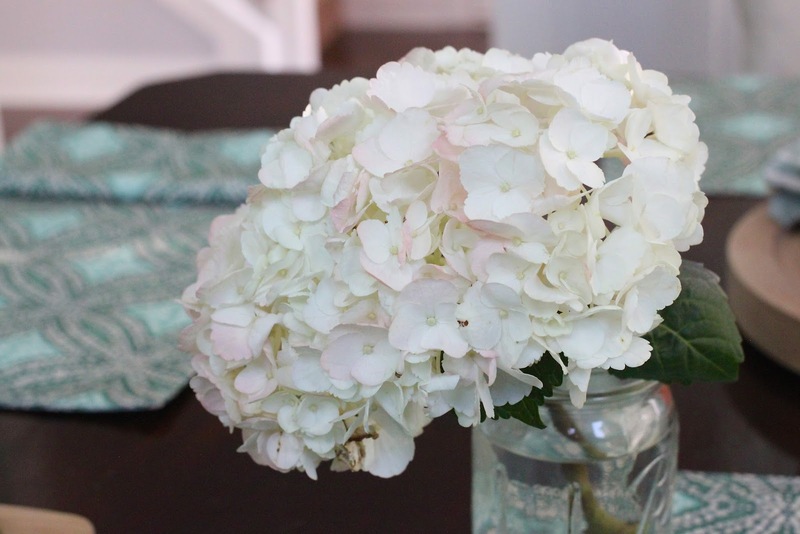 After a few hours, the hydrangea will have fully come back to life! 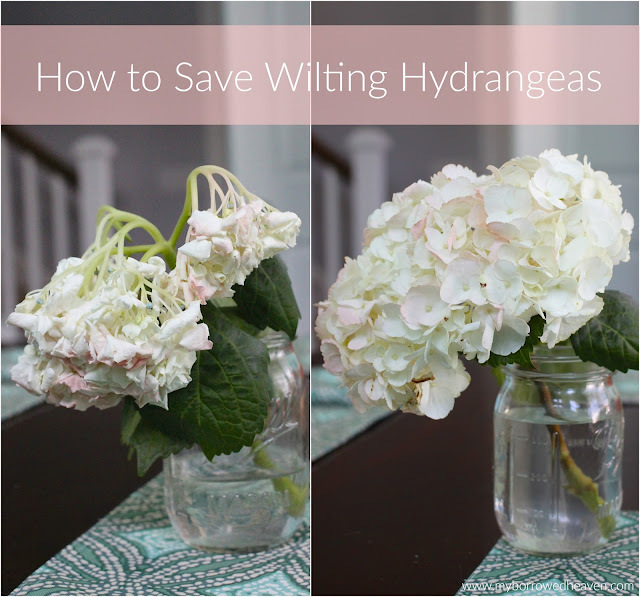 Don't worry, the water will cool down as the hydrangea comes back to life, and there is no need to add additional hot water. Seriously, it works! If you want to keep your hydrangeas lasting a long time without taking the time to use this method, make sure you refresh the hydrangea's water every other day. When you do this, it's also a good idea to cut the bottom inch off the stem. If any leaves are low enough that they're sitting in the water, make sure you tear those off from the stem, as well. So far, these have lasted another 3 days after I thought it was a goner! Beautiful and full as ever! I never would have thought about this method to save flowers! It's seriously like night and day with the before and after pictures! Holy cow, this is amazing! 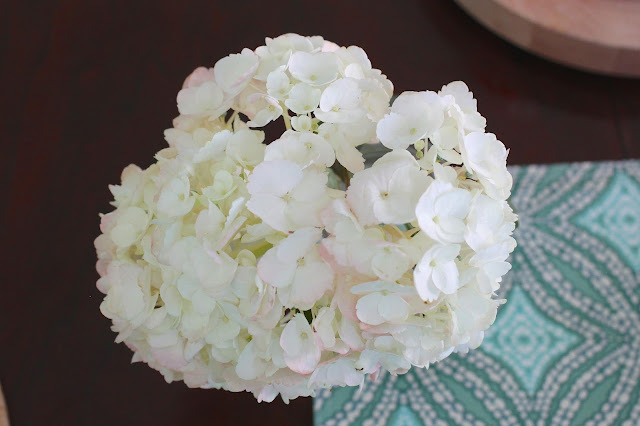 Pinning this for sure and buying some hydrangeas this weekend! Thanks for sharing! That is awesome. I would have never thought this would work. This is awesome! I would have never guessed that something like this would work. It's brilliant! Wow! I had never even heard of that! I love it. NO WAY! 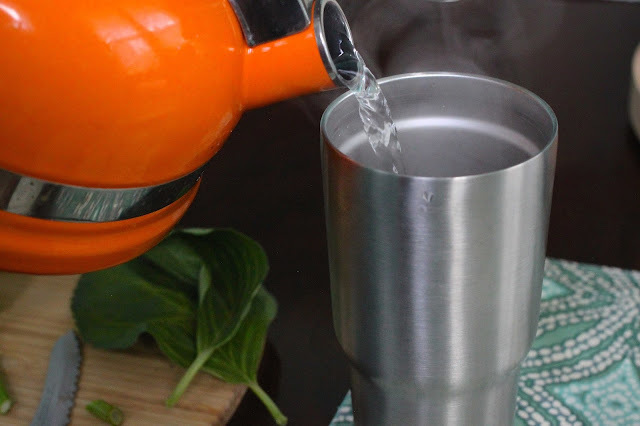 Water and cutting the bottom part of the stem was always my solution, but I had no clue about boiling water. I can't keep plants alive for the life of me. The only one I've been able to lately is one that we got on our move in day, so its been alive for over a year because it does its own thing, you put water in once a week and call it a day. So I guess I've had success with only one plant, ha! This is amazing! Had no idea you could do this! 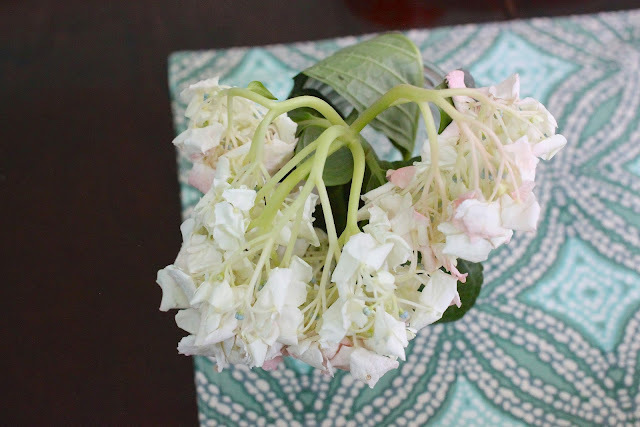 Such a great tip for one of my favorite flowers! !